For those with Parkinson’s disease, mobility is often a challenge. With a high risk for falls, not only does a person dealing with Parkinson’s disease worry about the physical repercussions of an injury, but difficulties with mobility impact independence, resulting in an overall quality of life concern. A walker helps provide greater stability and support for those at risk for falls due to the effects of Parkinson’s disease, such as freezing, retropulsion, muscle stiffening, and loss of balance. 29-inch turning radius, allowing you to navigate through tight areas and sharp turns throughout your home. This is a 40% sharper turning radius than the average rolling walker. A brake systems that ensures the U-Step II moves only when you are stable and ready for it to move. Squeeze either the left or right brake to roll the walker when you are ready. 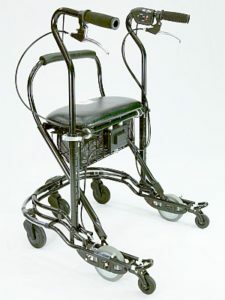 The walker will not roll away when you are moving from a sitting or standing position. A height-adjustable design that allows you a more upright, correct posture than traditional walkers. Spring-loaded front wheels that transition between surfaces and heights, avoiding the need to pick up or lift the walker when going over cracks, curbs, carpets, and more. 22-inch width, enabling you to move effortlessly through doorways, hallways, and other narrow spaces. Adjustable resistance settings, for those who feel walkers roll too quickly for their comfort. Easy transport, with compact foldability and one-step setup. Optional basket to hold belongings beneath the cushioned seat. Optional rear backup lock for those concerned with falling backwards. To see the U-Step II Walking Stabilizer in action, click here to watch a video! Westside Medical Supply of Rochester, New York, is your trusted source for home medical equipment, as well as hospital and home medical supplies. Our goal is to give you regained mobility and independence. The U-Step II Walking Stabilizer, as well as many other types of walkers, canes, stair lifts, lift chairs, and other types of mobility aids, are available for ordering through our company. For more information about our products, or to place an order, please visit https://www.wmsupply.com/ or call us at (585) 227-8750 today.